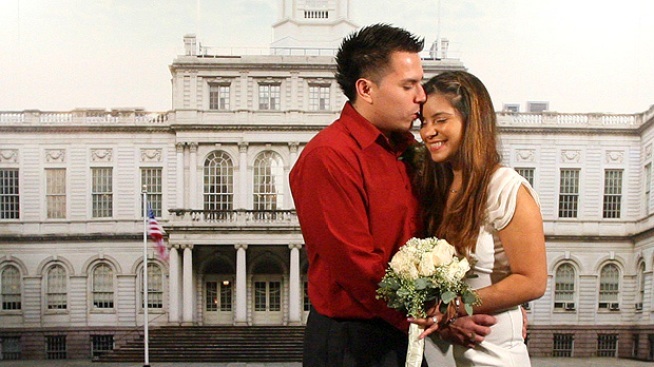 Jennifer Avila, 22, and Carlos Sanchez, 27, the first to wed at Manhattan’s new Marriage Bureau. Watch out, Las Vegas: New York City wants to become the new No. 1 place to tie the knot. Mayor Michael Bloomberg has given City Hall's famously gritty marriage bureau a gleaming makeover, with fewer lines, more space to take photographs, video screens to monitor wait times and wedding chapels with gauzy curtains and walls painted in muted tones. And in case the newlyweds-to-be forget any essentials, the space features a small shop that sells fresh flowers, disposable cameras, tissues, hairspray and sparkly fake diamond rings for $9 each. The sleek 24,000-square-foot space officially opens Monday, replacing a grubby, cramped, poorly lit office. It is designed to put some glamour into City Hall weddings while bringing more tourism dollars to the city. "We want to be the wedding destination of the world," said Deputy Mayor Patti Harris. In 2008, the city issued nearly 70,000 marriage licenses and is set on competing with places like Las Vegas, which tops the list. There may be an opening now, though, as business appears to be dropping there. Clark County, where Las Vegas is located, issued 95,888 licenses in 2008 — its lowest number in 15 years, according to figures provided by a county spokesman. Couples seeking to say their vows before the city clerk in New York will now do so in an ornate lower Manhattan building that dates to 1929 and still retains some of its original features like grandiose columns and marble floors. Before its nuptial makeover, the space had been used for various government activities, including the Department of Motor Vehicles and some federal operations after the Sept. 11 attack. Construction on the overhaul began in 2006. Officials overseeing the $12.3 million project even brought in Bloomberg's favorite decorator, Jamie Drake, who worked on his Upper East Side town house. The result is a gleaming ground-level space with soft lighting, cushioned seating and computerized kiosks for online application processing. There are also large restrooms with vanities and full-length mirrors, giving brides more room to primp for the big moment. Couples can also bring iPods to play their own music during ceremonies. The Bloomberg administration, always searching for new ways to market the city to tourists around the world, has plans to advertise its marriage bureau to attract more visitors. It is also working with local hotels and other attractions to create special wedding packages for couples. New York state law requires brides and grooms to wait 24 hours after getting a marriage license before they can have the ceremony. Those from out of the country need only to have valid passports, according to the city clerk. Marriage licenses cost $35, and there is a $25 fee to hold a ceremony at the new facility, although the city says those amounts might increase. Officials gave the media a preview of the new space Wednesday and kicked off the launch with the wedding of a Queens couple, Carlos Sanchez and Jennifer Avila. Afterward, the newlyweds said the marriage bureau makeover gave them a romantic setting for their wedding — a major improvement from the old digs. "It's not comparable," Avila said. "This place is beautiful."